We arrived home from our 9 day camping trip last evening - I missed you all! I will warn you, there are a lot of photos below, I hope you'll enjoy them. This camping trip is also our family reunion and there were almost 30 of us there!! When we arrived I walked down to our beloved bay and snapped this photo. 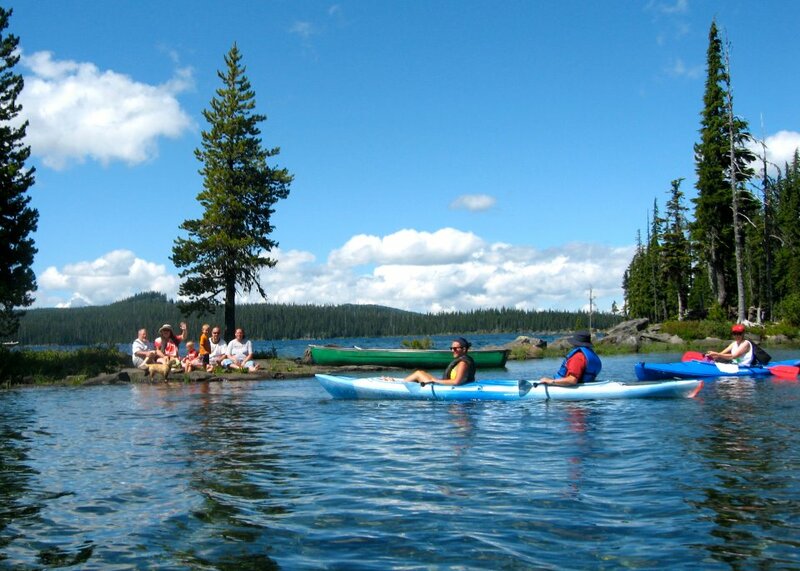 This lake is the 2nd largest natural lake in Oregon with a visibility depth of 115 feet, one of the purest lakes on the planet. Every single day was this perfect! Warm days and cold nights. 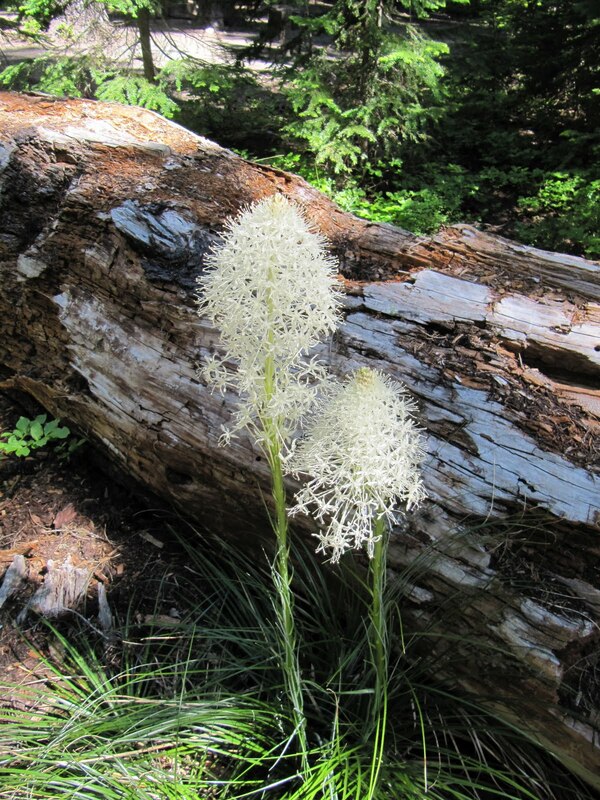 The Bear Grass was in full bloom this year.. many years the bloom is over, so I got some photos of it. It's beautiful! A close up of the Bear Grass bloom. When we got set up, I shot some photos of the interior of our trailer, this is the dining table. Buddy loves to sit on the back of the sofa to keep an eye on chipmunks and my brother's West Highland White Terrier, Tux. He's sitting on my granny stripe blanket I made. I crocheted 2 dish cloths the first few days with this lovely lime green cotton. I'll try to share the pattern soon as I loved how it came out. Our kitchen, with a watermelon in the sink! Dayle cut it up and put it in the fridge, it was sweet! Our comfy bedroom.. with Buddy scampering across the bed. I love my Canon PowerShot SX200 IS with 12x zoom.. this Chipmunk photo was taken from the kitchen window! Our first dinner, Dayle is the chef and made baked potatoes in the trailer oven, sauteed frozen green beans with bacon and onions and BBQ'ed filet mignon on the grill outside. Our first night.. sunset on the point. Not real colorful as there were no clouds, but pretty. I got some pretty bad mosquito bites on the tops of my feet that night and had to put cool washcloths on my feet to settle down the itching.. but never had any more bites react much after that night. The lake is known for it's mosquitos! The full moon was up as we turned to leave the point that night. 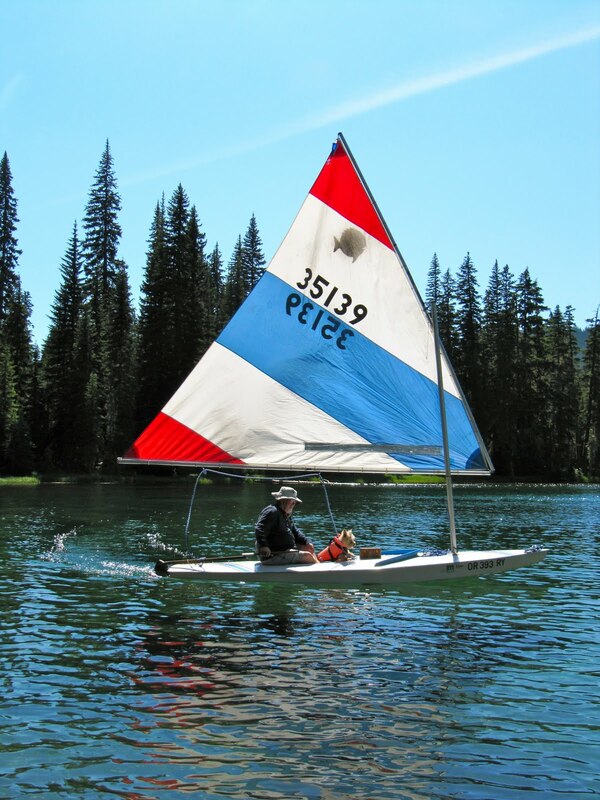 The next day we launched our Sunfish sailboats and sailed to "Amy's Blue Lagoon" - my sister named this spot after our daughter and at least in our family, we call it that. It's where we go to sit in the sun and swim - as it's protected from the wind by a pretty little island.. many people don't know this spot is there. I took a photo of my foot hanging off the side of my boat to show you how clear the water is. My sister and her husband kayaked over to the lagoon to meet us as we sailed in, that is Dayle and Buddy behind them. I spotted this meadow full of my favorite wildflower, Shooting Star, in the spit of land where we make landfall at the lagoon. Here is Dayle and Buddy the Cairn Terrier in his life-jacket. Here's my Sunfish at rest while I was taking photos. My favorite sailing photo this year.. Dayle at left and my older sister on the right. D and older sis "posing" and my younger sis and her husband in kayaks. Hubby took this photo of the protecting island and the lake beyond. We arrived on Wednesday early afternoon and our daughter-in-law, Kristi, arrived with our 2 and 3 year old grandsons on Friday - here they are the next morning having breakfast that grandpa made of sauteed ham, diced potatoes, eggs with cheese melted over it all - great camp breakfast. The next day they found a frog and 2 tadpoles and brought them back to show grandpa and grandma. A close-up of Shooting Star wildflowers on the rocky side of the beach where we keep the boats when not in use. The annual family photo on the log on the side of the bay. Dayle is simmering chicken thighs in teriyaki sauce over the fire for our Chicken Teriyaki Yakisoba Noodle dinner with lots of veggies. YUM! With Dayle enjoying being chef, I could work on my crochet flower shawl in front of the fire, although I did put it down to go in the trailer and chop the veggies for the stir fry - onion, cabbage, mushrooms, pea pods, broccoli, carrots and celery. The boys were up early riding bikes around the circle near our campsite. Our campsite.. I drive my car with the boat trailer and Dayle and Buddy pull the trailer behind his 1 ton Dodge dually. Our son arrived on Sunday and on Monday he paddled me in our canoe out to the little island in the mouth of the bay - Kristi kayaked out with Caleb and Hayden and the dog were in the canoe. This turned out to be a highlight of my week as the boys had so much fun and our dog got to run free which he never gets to do ordinarily. I'm not sure if you can see it, but at the end of the island is a cool little fort made out of stacked rock - Travis, Kristi, the boys and the dog went to explore while I took photos. Picturesque photo from the island across the lake. Kristi and the boys exploring the island. Travis then went to get "Papa" - the dog is sooOOoo happy to see "dad". Travis and the boys exploring the other end of the island. That afternoon Travis and Kristi borrowed my camera and took some photos of the boys making new friends on the beach.. this is Hayden and "Bella". Both boys running and having fun. That afternoon we started a fire and made "S'mores" - this is my monster one with some toasted marshmallows, a whole Hershey's chocolate bar and 2 whole graham crackers. I broke it in half and shared it with Travis. 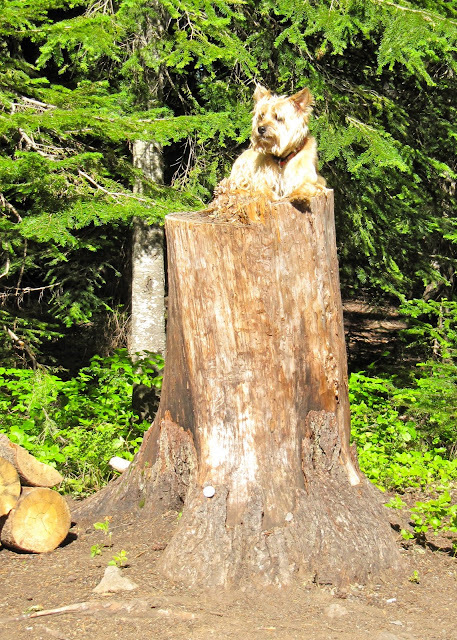 Kristi posed Buddy on top of this stump.. doesn't he look like a bear? Roarrrrrrrrr! Our son Travis drove up in his 1966 Mustang GT fastback and Kristi drove her VW camper bus. I took these photos of the island with the warm evening sun slanting across the lake. Grandpa took this shot of the boys looking up at the sky. Our campsite.. notice my crocheted bunting/pennants/banner? Dayle used my nice wooden kayak paddle to hold up the tarp.. sheesh! On Wednesday, Dayle, my sister, brother and I sailed to the lagoon and swam, then sailed up the lake, then we sailed to the boat launch and loaded our boats for our departure on Thursday. This is me on my boat heading to the lagoon. How pretty is this?? My sail. Story time: Ten years ago my sister called and told me about this ad in the paper of a new Sunfish for sale. So, I called the guy and he'd won this at a convention. The sail was custom designed to advertise the movie "Tequila Sunrise" starring Mel Gibson, Kurt Russell and Michele Pfeiffer in 1988. I talked him down from $950 to $750 on the phone.. then went to pick it up.. did I ever SCORE! This was brand new, in the box with a custom sail!! These boats new are now over $4k and that is not with a custom sail. I **LOVE** this sailboat. There was still snow there on the ground!! It's 5400 feet in altitude, as high as Denver, Colorado which is nicknamed the "Mile High City". Wildflowers on the edge of the beach.. Bunchberry. Heading down from the lake.. this is Dayle and our trailer with Mt. Zoran in the distance. And so.. hope I haven't worn you out reading this post. I missed my blog and blog friends and all those who take the time to read my writings. Sounds like a wonderful time. I wouldn't mind camping if I could stay in your camper. I'm tiny so I could just curl up in the corner of the sofa. Loved all your pictures. Just beautiful. What fabulous photos ! Looks like you all had a wonderful time . I gotta say , you're killing me with all the yummy meals and those s'mores look absolutely scrumptious . The crochet flower shawl is beautiful ! I so enjoyed hearing about your vacation. Would you mind sharing the name of the lake, and the name of the campground you stayed at ..... I really think we need to go there. Your pink wildflower might be "Elephant Heads"
Okay - now I want to know the name of your lake. Teresa, these photos are absolutely amazing. What an incredible time! And, I had no idea that camping cuisine could be so fancy! Your photos are beautiful Teresa. I'll look forward to the pattern for that pretty green dishcloth. It looks lovely,those little boys will have great memory's about this trip! I sat through your whole post with my mouth open going wwwwooooooWwww!!!!!! Your trailer is amaaaaaazing, I just showed it to J and he thought i was showing him your house LOL! Gorgoues scenery, but most of all lots of family love in your pics and descriptions, it sounds and looks idylic. So lovely .......thanks for sharing Teresa. That toasted marshmallow 'sandwich' looks amazing! The scenery is just beautiful. You have some beautiul photos, what an amazing place to go camping, I can't imagine waking up to views like that every day! Glad to see you got a bit of hooky time in too! You've made me really hungry with all that jacket potatoe, fillet mignon, chicken teriaki talk!! I wish my family had big holidays like yours, it's so lovely to have everyone together :-) Glad you're back! Welcome Back, Teresa!! I so enjoyed your fabulous photos of your stay in such a beautiful place...the lake and its surroundings are so perfect, your family gathering is such a precious time, and the camper looks sooo comfortable. I loved your Sunfish sailboat too and the colourful pictures of your gorgeous crochet flowers. Great to see your trailer from the outside ~ I've always wondered how big it was! Your pictures were absolutely wonderful! Such beauty! I would love to camp there sometime. My father and I often talk about going to Oregon or Washington just to see the beautiful landscape and you have made it all the more desirable :) It sounds like you have had a splendid time with your family. How special! Those memories will last forever! It's great to have you back and thanks for sharing! We missed you too, Teresa! I enjoyed looking through these photos and your narrative so much. You got some great photos, as usual! The food y'all had looks wonderful. Maybe you can share your chicken soba noodle recipe when you get settled in from your trip? Looks like something we would love. What a great trip! Welcome home! Your post was beautiful! Such picturesque visions. Would love to see it with my own eyes. Lovely pictures Teresa, love all the beautiful lake and island shots. Love all the photos of the family having a wonderful time. Thanks for sharing them with all of us. All of your pictures are beautiful. I love the potholder and the lovely flower shawl. What yarn are you using? It looks like Caron brights? It's beautiful and I can't wait to see it all finished. Glad you had such a great time, the pictures are awesome. OH, thanks goodness you are back. We missed you so all week long. With Kris camping too, it was very quiet in blogland. Now, about all those wonderful camping tales and pictures. Where to begin.... well, how's about tomorrow when I come back for a second peek, it's too much for one to take in all at once. Right now, I'm off to figure out how to micro a smore. The crochet blankets are beautiful too, the pink & gray and the rainbow one, and the green dish cloth...love the color and pattern! The clear water must be really neat to see, and the Amy's Lagoon is just gorgeous! All those tall pines! I've looked thru your pics 3 times already! Love them!!! Love reading your blog! 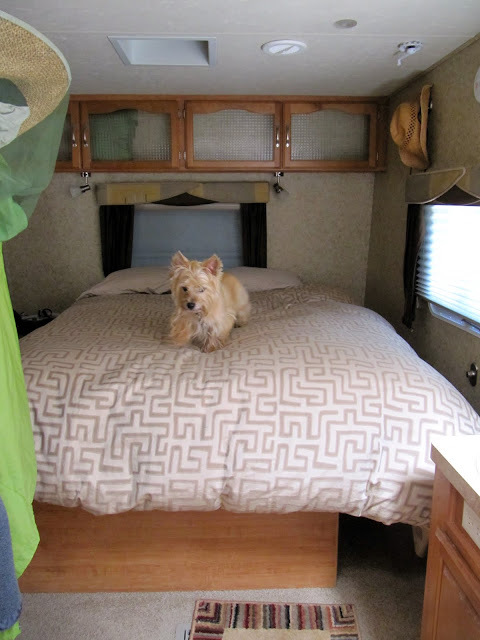 This looks completely idyllic Teresa - what a luxurious caravan! I loved the images of the chipmunk and those wildflowers - so different from here. Your dinners looked so tasty too! But I can't stand it that I keep missing it all! Please consider adding the option to receive new posts by email. I don't want to miss any more of your loveliness! I see you have a "Subscribe by email link here, so is that for the comments or will it get me your new blog posts too? Wow! Looks like a wonderful trip. I am now starving for smores...mean woman :) Glad your back! What wonderful pictures! Thank you for taking us along on your camping adventure--so refreshing--just what I needed! Oh it looks so lovely and I will just have to come to the West coast someday. Is the water cold to swim in? I thoroughly enjoyed this post! You totally know how to do SMORES!!!! Your lake which I am not familiar with looks like, well they all pretty much look the same there in Oregon. I grew up going to Green Peter, just past Sweet Home. There is camping all up and down the Quartzville Corridor. Your pictures put a smile on my face and made me a little more homesick at the same time! I wanted to camp so badly when I came out for my visit, but its not going to happen. Thankyou again!